Flavored Whipped Cream is a great way to add extra flavor to coffee and desserts. 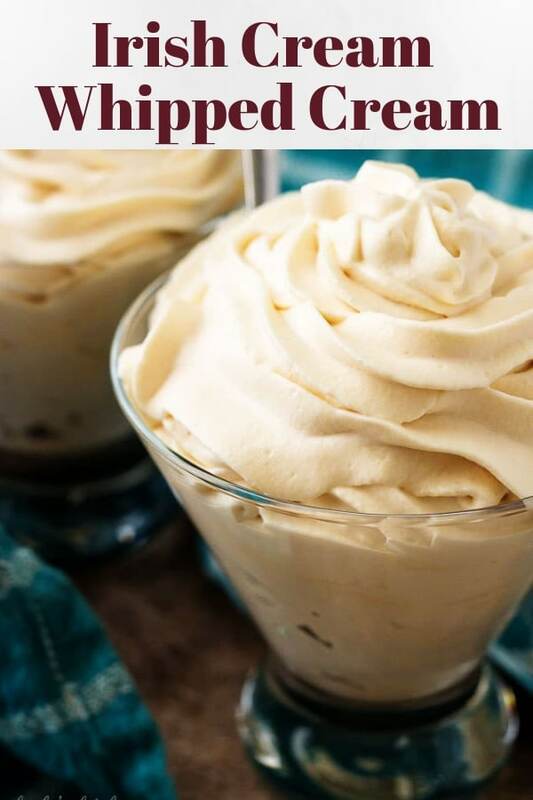 Toss in some boozy Irish Cream, and you’ve got the perfect three ingredient whipped topping! Have you ever made homemade whipped cream? It’s probably one of the easiest recipes that we have on the site, and it’s one of the easiest that comes to mind in terms of fast, homemade recipes. Fresh whipped cream is one of best ways to elevate desserts like pumpkin pie, blueberry pie, and berry cobbler to the next level. It adds so much creaminess and texture that store bought topping doesn’t even come close. Sometimes, we even like to make flavored whipped cream to add to things like coffees, brownies, or other desserts. 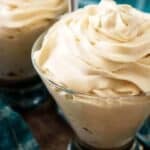 This Irish Cream flavored whipped cream is one of our favorites! It makes a great topping for our Coffee with Kahlua, Iced Coffee with Bailey’s and Kahlua, and Frozen Salted Caramel Turtle Coffee. Irish Cream consists of Irish whiskey, cream, and flavorings blended together make a cream liqueur. 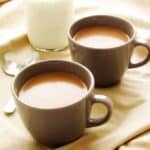 It’s commonly used to add a creamy flavor to coffee and cocktails but can also be consumed alone. Our Irish Cream Whipped Topping only contains three ingredients, so this recipe is easy peasy. Measure out the Irish Cream, powdered sugar, and heavy cream. You can use a stand mixer or a hand mixer to combine the ingredients. Whatever method you choose, make sure the bowl and whisk are completely clean and dry. It also helps if the bowl is metal and cold, but it’s not necessary. Start by combining all the whipped cream ingredients on low speed until mixed. Then slowly increase the speed to incorporate more air. The mixture will begin to thicken, that’s when you know it’s “done.” The alcohol in the liqueur does make it difficult for the cream to stiffen, so be careful not to add additional liqueur. 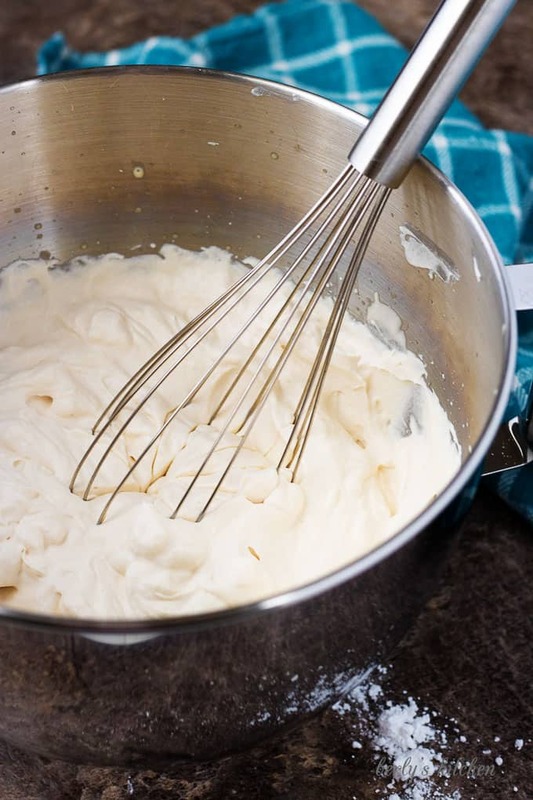 As mentioned above, use a cold metal bowl and whisk (or whisk attachment) to make the whipped topping. This helps keep the heavy cream and Irish Cream cold during the mixing process. Mixing alone generates heat, so it’s helpful to keep the liquids as cold as possible. This whipped cream is a “soft set,” so it won’t form stiff peaks. If you’d prefer a firm setting whipped cream, cut back on the Irish Cream to help the heavy cream set up a bit more. We like to use powdered sugar instead of granulated sugar, because it dissolves better. If granulated sugar is all you have on hand, use it. It still works great! However, it may be a little grainier in texture. We’ve used both heavy cream and heavy whipping cream. Both varieties work equally well. 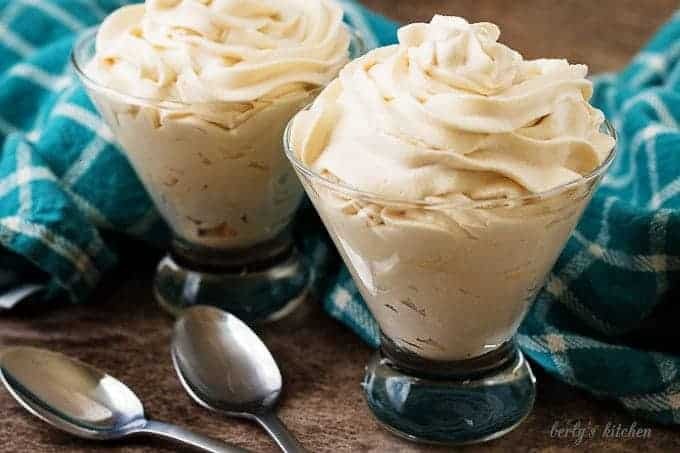 If you like this flavored whipped cream recipe, please leave us a comment and rate the recipe card. You can also find us on Facebook, Pinterest, Twitter and Instagram searching for Berly’s Kitchen! Flavored Whipped Cream is a great way to add extra flavor to coffee and desserts. 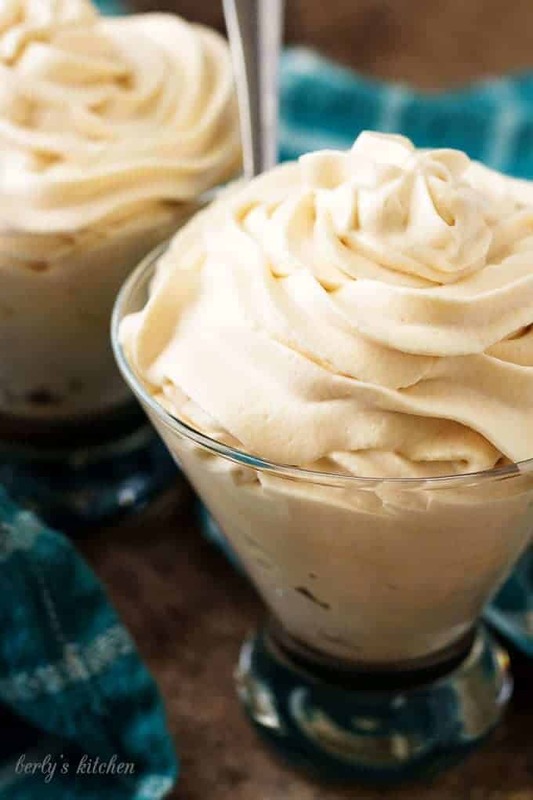 Toss in some boozy Irish Cream, and you've got the perfect three ingredient whipped topping! Place heavy cream, Irish Cream liqueur, and powdered sugar in a large bowl. 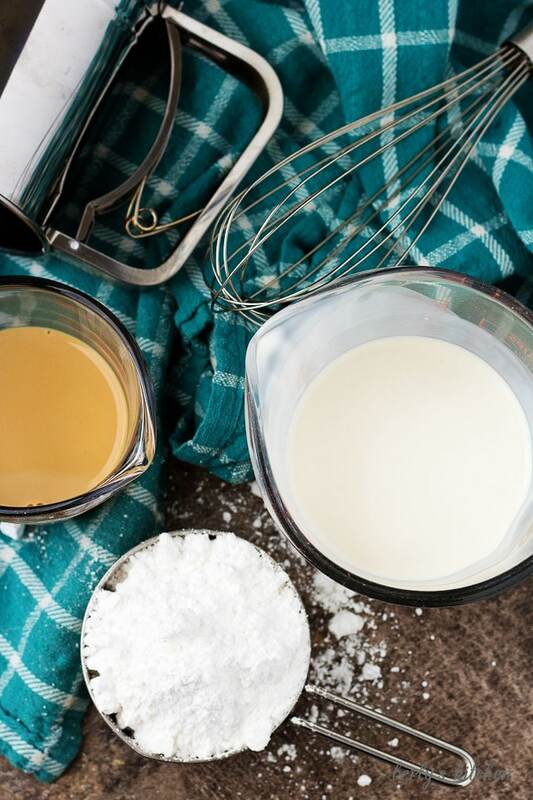 Use a hand or stand mixer to mix on low speed until the ingredients are combined. Increase speed slightly to incorporate more air. Continue to mix until the whipped cream becomes a smooth "soft set." Add to your favorite drinks or desserts. Store in an airtight container in the refrigerator for 3 days. *Calories listed are an approximate and based on the serving size and ingredients listed. *Please see post for more in-depth information and tips regarding the recipe. Yum! Looks good. I’m hoping my friend comes through with a bottle of Bailey’s next week when we get together. The joys of having a relative work in a liquor store and free samples! Thanks so much! Oh, the things we could make if we had that kind of liquor store hookup. Lol! Good luck on the Bailey’s and Happy Holidays!